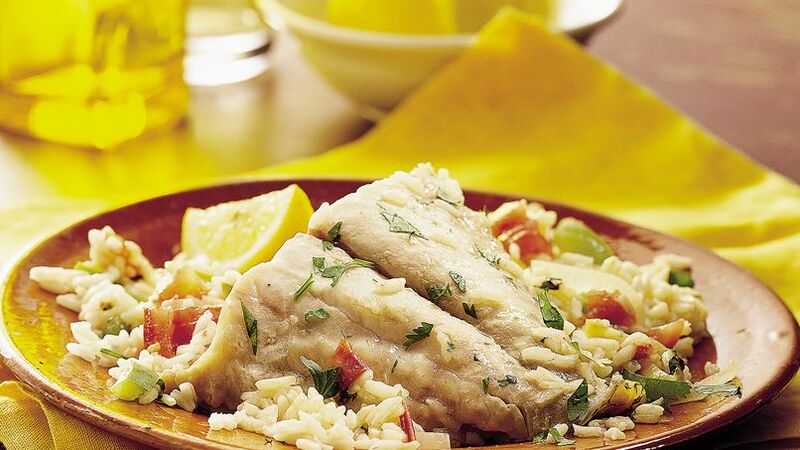 If fish fillets are large, cut into 4 serving pieces. Heat 10-inch nonstick skillet over medium heat. Arrange fish, skin sides down, in single layer in skillet. Cook uncovered 4 to 6 minutes, turning once, until fish flakes easily with fork. Remove fish to warm platter; keep warm. In same skillet, cook remaining ingredients except wine over medium heat 3 to 5 minutes, stirring frequently, until bell pepper and onion are crisp-tender. Stir in wine; cook about 1 minute or until hot. Spoon tomato mixture over fish. For a slightly sweeter-tasting sauce, use a red, yellow or orange bell pepper.